Read more about the new K-System solenoid drivers. 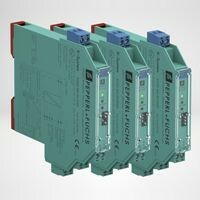 Meet the latest highlight to Pepperl+Fuchs’ K-System portfolio of intrinsic safety barriers: solenoid drivers with line fault transparency (LFT). These modules help you use digital output (DO) cards to their full extent. Their entity parameters are compatible with over 90 % of solenoid manufacturers, and their input circuitry is designed to be compatible with all major control and emergency shutdown (ESD) systems. This ensures easy integration, regardless of the system you use. The new K-System solenoid drivers with LFT let users take full advantage of line fault detection features on expensive DO cards, without any additional wiring. Line faults can be easily located on the field or control side, simplifying continuous monitoring and increasing plant availability.